The latest reports of a Dwight Howard trade now include the Clippers as the elusive fourth team necessary to land the All-Star center in Brooklyn. If those reports are accurate, and I haven’t yet completely lost my mind, it appears as if the missing piece Orlando needs to complete its desired haul for Howard is a lottery-protected, first-round pick from Los Angeles. With that pick from the Clips, the terms of the deal ESPN.com has reported would bring Brook Lopez, Luke Walton, Damion James, Shelden Williams, Armon Johnson, and three first-round picks to Orlando. Let’s think about that for a moment. The best center of his generation and one of the three most valuable players in the league is traded for one guy likely to be in an NBA rotation (Lopez), a bunch of roster fillers, and three picks guaranteed to be in the 20s. To be fair, I have to reserve some judgment, only because I don’t know who Armon Johnson is. It should be noted that no matter what the package for Howard ends up being, Orlando spent much of its efforts with one hand tied behind its back. Dwight Howard’s continued attempts to become the most hated man in American professional sports and 30-year-old GM Rob Hennigan’s 20 days on the job haven’t left the Magic with much leverage. That being said, there has to be something better out there. This seems to be a case where the obvious answer is the right one. There are two franchise centers in the NBA. Both of them have contracts set to expire at the end of the 2013 season. And they each would be a better fit in the other’s city. Why is this so hard? Apparently it’s because neither team wants to risk trading for a player who’s made it known that he isn’t interested in re-signing with that team. Andrew Bynum’s “There’s a bank in every city” phase appears to be a case of Bynum being Bynum, and his most recent comments indicate that he would want to explore free agency. And we all know the “one team” on Howard’s list. My only response to that is who the hell cares? For the Lakers, there has to be at least some confidence that one season in Los Angeles with Kobe Bryant and Steve Nash would be enough to convince Howard to stay. The allure of something new in Brooklyn is understandable, but one Finals game as a member of the home team at Staples Center has its own pull. Bynum is an excellent player, but Dwight Howard is Dwight Howard. For Orlando, isn’t the opportunity to coax Bynum with more money and the chance to be “the guy” better than a guarantee of Brook Lopez? Bynum would finally have his chance to be the focal point of the offense with the Magic in a way he hasn’t and won’t as long as Kobe Bryant is alive. The Lakers’ trade for Steve Nash means they don’t have the picks that Brooklyn can include, but again, with Howard, Joe Johnson, and Deron Williams, those picks never figure to be higher than 25. 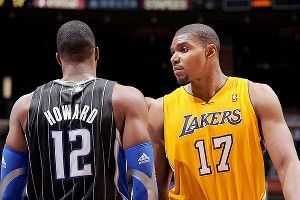 Again, the barriers to a Bynum-for-Howard deal aren’t news, and they can’t be ignored. If the lack of picks is now the deciding factor, then that’s all there is to it. The point is that it shouldn’t be. At 100 percent (in terms of both health and effort), only LeBron James is as valuable as Howard, and Orlando’s haul for him should reflect that. Bynum is the only All-Star the Magic could get out of this. That is, unless Armon Johnson is way better than I know. How Can Team USA Use Blake Griffin Effectively?